Posted in News, under Asia. Tagged with China, student recruitment, UK, WeChat. 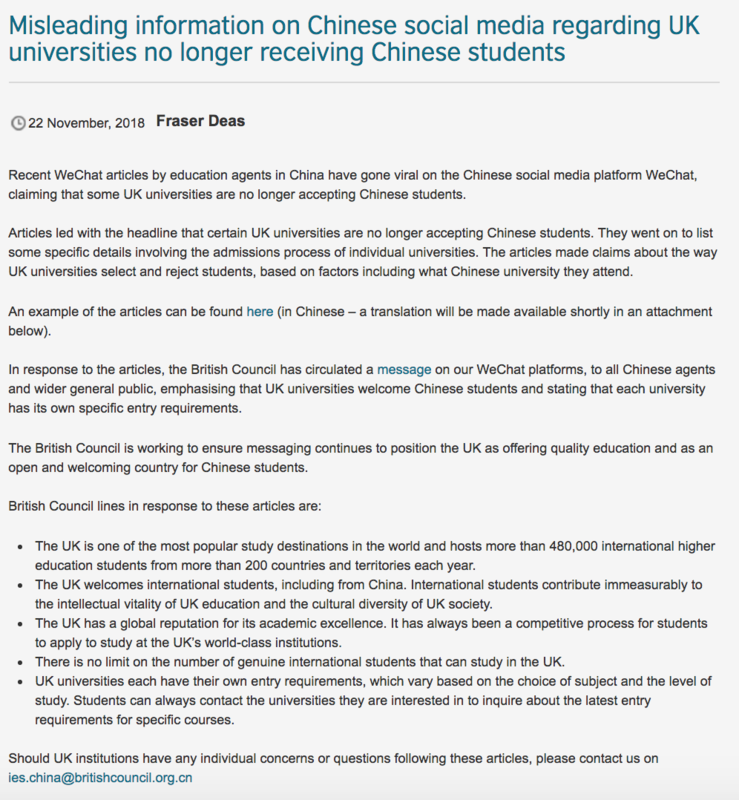 Information spread on China’s most popular social media platform about UK universities suspending the recruitment of Chinese students has been branded “misleading” by the British Council. 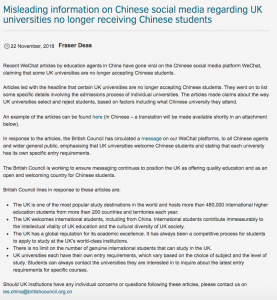 Though the pages have now been taken down, several UK HEIs were named by the article, which purported to have proof that Chinese students were ‘banned’ from the institutions. Through its own WeChat account, the British Council sought to clarify that the UK has no restrictions on the number of international students it can receive and British institutions are very much open to recruiting Chinese students. It recommended that prospective students wishing to study in the UK should obtain detailed information from official institution websites or by contacting institutions directly. It is highly likely that Chinese students believe what they read on WeChat, without checking the fact elsewhere, according to Fang Zheng, international student adviser at the University of Sheffield. She worked on the university’s project on using WeChat to engage Chinese students. Chinese students have a tendency to get information and take advice from their ‘friends’ on WeChat, she said. Misleading information exists on WeChat, in the same way it exists on Facebook and Twitter, she noted. “Any information published on WeChat can be quickly shared,” she said, through personal chat, or friend circles, among other features. According to regional manager East Asia at Lancaster University, Xiao Cui, WeChat is one of the most powerful tools in terms of the speed of disseminating news. 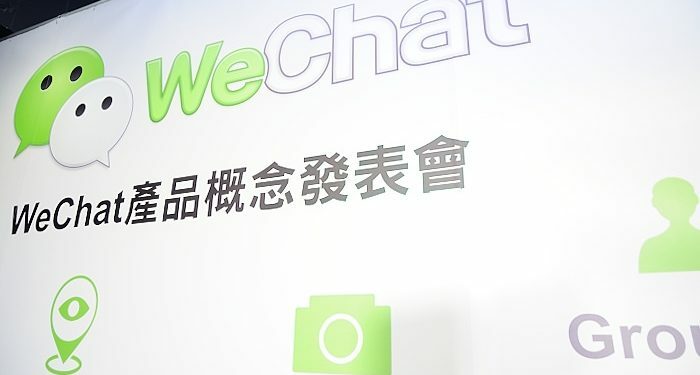 The university’s WeChat account is managed by a team of Chinese student ambassadors. “When I first asked our student ambassador to upload our Welcome to Lancaster Video, within one day it was viewed over a thousand times,” Cui told The PIE News. Queen Mary University of London was also targeted, and produced a video after finding out – since uploading it to the university’s WeChat channel, it has had more than 1.1 million views. In May 2018, WeChat had reportedly blocked 500 million postings, and has since launched a ‘rumour-debunker’ program. But false information being spread on the platform has not been an issue in the past, noted Caroline Baylon, director of international at the University of Bristol. The HEI in the west of the UK was among those named by the WeChat scammers. The institution ensures that any information it publishes “is as clear as possible”, and promoting that information via a representative office in China helps to avoid any confusion, she said. The office helps greatly in assuring that any possible issue is spotted and dealt with promptly, Baylon added. Along with Weibo, WeChat is a tool the University of Bristol uses extensively. In a statement in response to the misleading information that was issued on WeChat recently, the University of Bristol said it has its own entry requirements and competition for places can vary from year to year. “Like all leading UK universities, we regularly review our selection criteria to ensure we are making offers of study to the highest quality applicants that year,” it said.